Tasaki Hanshi was born in Tokyo on January 20th 1933. He began training in Gojuryu on August 15th 1951 and he is now the Vice Chief Director of Federation Gojukai and Official National Instructor for the Japanese Karate Federation. When Tasaki Hanshi initially started training there was boxing and other forms of karate available but the schools were not strongly organised and they didn’t have particular names. Tasaki Hanshi decided to choose Karate-do as there were many foreigners in Tokyo and as there were many street fights he wanted to learn self defence and strong fighting so he could defend himself on the street. Tasaki Hanshi trained with only one teacher, Gogen Yamaguchi Sensei, Hanshi trained with Yamaguchi Sensei in Asakusa with 6-8 other students that Yamaguchi taught personally, these included Nakaishi Sensei, Motomasa Mayama and Kenichiro Onishi Sensei. The training sessions were very different to the training we have now, the lessons consisted of the first 8-10 months of building the basics intensively and creating physical strength to be able to use the techniques as a good foundation, students were pushed to the limit of their endurance with jump-ing, sit-ups etc. There were no Karate-do techniques taught in the first 10 months of training. Yamaguchi Sensei participated in all of the training with the students and one of the main lessons that Tasaki Hanshi learnt was to breathe properly, this is why he is able to be more than equal to his younger instructors today. Tasaki Hanshi participated in the First Gojukai Tournament in 1963/64 and won first place in the finals representing Tokyo. Tasaki Hanshi prefers to teach dojo kumite rather than point style as with dojo kumite you can continue after reaching middle age whereas with point fighting if you lose your speed you lose your karate. Dojo kumite gives the student an edge, it does not rely on youth, if you step back in Karate-do you lose everything, therefore you must step in to receive. If you train only in modern karate, once you are over 30 yrs your Karate-do is over. Tasaki Hanshi’s favourite techniques are: kicking, Haito and Ura-uchi. Tasaki Hanshi considers his attachment to his students as very important. He notices the difference and tries to think of ways to improve each individual student, he also respects the individuality and character of each person and tries to build them up mentally and physically. 1951 – Joins the Yamaguchi’s Asakusa ‘All Japan Karatedo Gojukai’ Gojuryu Dojo. 1952 – Grades to Shodan in Yamaguchi Gojukai Go-juryu Karatedo. 1954 – Grades to Nidan in Yamaguchi Gojukai Goju-ryu Karatedo. 1957 – Grades to Sandan in Yamaguchi Gojukai Go-juryu Karatedo. 1961 – Grades 4th Dan and Jokyo Renshi license issued by Yamaguchi Gojukai. 1964 – Shihan license issued by Yamaguchi Gojukai. 1965 – Grades to 5th Dan in Yamaguchi Gojukai Gojuryu Karatedo. 1966 – Shihan Kyoshi license issued by Yamaguchi Gojukai. 1970 – Grades to 6th Dan JKF Gojukai. 1972 – Founds Seiwakai [JKF Gojukai] Gojuryu Karatedo. 1974 – Continues teaching Gojuryu Karatedo at his Dojo in Oshiage Tokyo, Japan. 1975 – Grades to 7th Dan, JKF Gojukai. 1986 – Acquired the grade JKF Gojukai 8th Dan. Shuji Tasaki was well known as Gogen Yamaguchi’s most competent fighter having proven himself in the very first All Japan Karate-do Gojukai Championships in 1963 which was basically a day’s competition of knock-out, knock down, break bone and finish them matches. Having earned the cup for first place it set him as a target to be dealt with in the Dojo. Today Shuji Tasaki Shihan is a much easier going person; still having the heavy and strong voice with a father like teachers touch. He left Gogen Yamaguchi’s organization in 1972 to form his own, Seiwakai, however today remains close to Goshi Yamaguchi and attends functions of the organisation, including the JKGA 50th anniversary, as a senior and respected Sempai – Shihan. 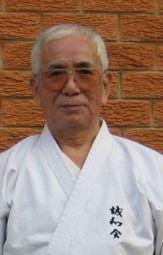 Today he is Hanshi of Gojuryu Karate-do Seiwakai and one of the most senior members of the JKF Gojukai. Tasaki Hanshi won the All Japan Goju Kai championships with a broken arm, he is also a renowned practitioner of Ikebana (Japanese flower arranging). These two facets of his abilities show true go (hard and ju (soft). Tasaki Hanshi’s nickname given to him by Yamaguchi Sensei was in fact Goshu. This is an abbreviation of his first name Shuji and Go being hard, meaning hard/tough Shuji. Yamaguchi sensei was my first teacher, and the only teacher for me. Yamaguchi recognizes me as one of his few remaining students. I chose this style because of the chance. Former Goju Kai in Asakusa. He was living there. He only had 6 – 8 students that Yamaguchi personally taught. I remember Nakaishi sensei that was directly under Yamaguchi . I do not know where that sensei is now. Compared with now – it is heaven. In those days it was hell. Lessons are now more scientific. The first 8 – 10 months were of building the basics intensively and physical strength to be able to use the techniques as a good foundation. No karate techniques were taught in the first 10 months. Jumping, sit up’s etc. To the limit of endurance. Many fell. No fun and very few continued. Very few now take that kind of training. Yamaguchi Sensei did everything with the students – even then. If I did this today, there would be no students. Learn how to breathe – A fundamental karate technique. That is why at my age, I can be more then equal to the younger instructors. First Goju Kai tournament held in 1963/64 and I won the finals representing Tokyo. 2nd tournament was in Wakayama – 2nd place. Hirano of Wakayama won, he was three years younger. In the same year at the second tournament, the Federation was born, asking not to have further tournaments until 13 years ago. Difference in kumite – No point system – then dojo style kumite and all the presently forbidden techniques were permissible. The Federation was formed in 1965 and instead of kumite – Point kumite was developed. GOJU KAI – WADO RYU – SHITO RYU and SHOTOKAN made the Federation. I have had a preference for teaching the dojo kumite versus the point style. i.e Teach as he was taught. By application, Goju dojo kumite gives you the edge, as it is not dependent on your youth. In karate if you step back you lose everything. Side stepping is good, younger have speed, older are slower. Therefore you must step in to receive. If you train only in modern karate, once you are passed 30 years your karate is over. Countless times. These happenings were in my 30’s and 40’s – These years people tend to stay away – sensing the need to do so , they stay away from him instinctively. Even today the above two are still practicing in there own dojo’s. Not really rivals, he wanted to emulate those 20 years ago. In KANSAI area, they still produce very good students. The gap has not been filled. The gap referred to is that Goju Ryu started near Kyoto first, and has produced more and better students then the Tokyo area. Each generation seems to have there own great karate-ka. Of Tazaki it was him and YAMAMOTO. Before and after, Who were the special ones? ISHIHARA and CHIBA – his primary students. Shuji SAKAMOTO is another and TAKAHASHI is the third. ISHIHARA was exceptionally strong. There were 5- 6 others but they no longer train. With regards to GOJU KAI as opposed to traditional Goju Ryu, Can you tell us about your Ryu and how it differs? Goju Kai was formed in 1965 and joined the FAJKO( JKF- later) in the same year. The Goju Kai was originally formed by Gogen Yamaguchi sensei. After a few years Yamaguchi quit – and the GOJU KAI continued as renmei Goju Kai. Ujita sensei was the president. JKF is the official karate body in Japan and Okinawa. Asakusa dojo – in the years after the war, were violent years. When a student was promoted to black belt, he was to go into the street; bow to the first person then hit him. If he went backwards it was no good. If he collapsed this was good. This of course cannot be applied today. To finalize the interview, what relationship if any is there between SEIWA KAI and the late Gogen Yamaguchi’s IKGA group?